The 20 Greatest Synths In The World… And How To Use Them! It's no secret that we love a good synthesizer here at FM. Sure, we're also partial to a decent drum machine or a quality sampler too, and we can easily get hot under the collar about a well-spec'd DAW, but it's mostly all about the synths. From gritty analogue monosynths to complex digital ambience machines - we're a bunch of self-certified synth nerds. And what do nerds do with things they love? They make lists about them of course! There is, however, much more to our bumper-sized cover feature than just arbitrary list making. In fact, the crux of this issue is all about the tutorials. We're using our favourite hardware and software synths as a jumping-off point to explore all sorts of synthesis and sound design techniques - from classic analogue sound-shaping to creative effects processing and beyond. Alongside each synth in our list you'll find a tutorial, and each tutorial comes complete with a video in which we go even deeper into our sound-shaping subject matter. 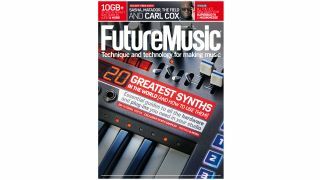 To get the most out of this issue, be sure to grab all the videos, audio and synth-tastic samples from: http://vault.futuremusic.co.uk.